Spent $40 for $113 Worth. I have been having some great shopping trips lately and today's Publix trip was no exception. 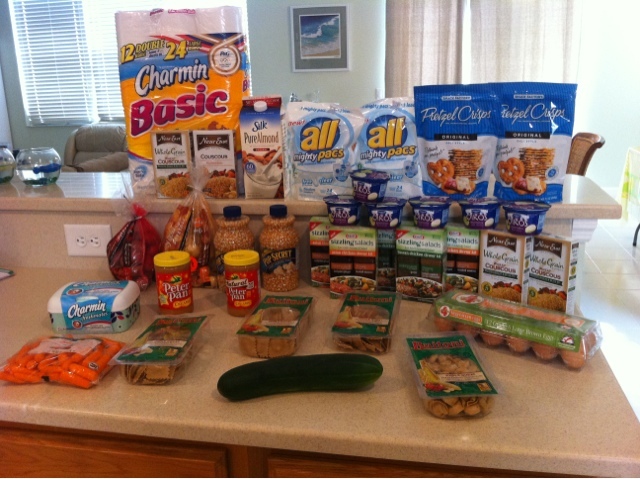 After hitting up Publix earlier this week to buy lots of salad and swinging by Target to grab some Quaker deals, I was so happy to be able to stock up on tons of pantry staples and basics for only $40 at Publix today. I know that you are probably sick of me talking about how great couponing is but today was just one more reminder for me. Due to the slight chance that Tropical Storm Issac might have an impact on our area, people were going crazy at the store stocking up on hurricane supplies, water and household products. Thanks to a summer full of couponing, we are so well stocked on everything we could possibly need I was able to spend my whole trip shopping the super deals and getting some weekly basics without having to worry about needing any storm supplies. Just in case we lose power (which happens in a measly rain storm around here), I didn't buy any meat this week and we will just eat from the freezer. I was able to find an empty checkout aisle with a very helpful cashier so I did break my trip up into two transactions to use two $5/$30 Winn Dixie coupons. You all amazing me with the great deals you snag. Thanks so much for stopping by Posed Perfection and leaving me sweet comments today. I look forward to the next sharing party. Have a delightful Sunday!